PRINT & POST ENTRY FORM AVAILABLE NOW! YES YOU CAN JUST ROLL UP AND ENTER ON THE DAY!! Download & Print this entry form to enter using snail mail. Please make sure you mail your entry form with enough time to reach us before each cut off date, and not within 1 week of the event. Payment options are Chq & Money Order. Passenger Info & Requirements HERE – check and make sure you meet the ID requirements to avoid disappointment on the day! 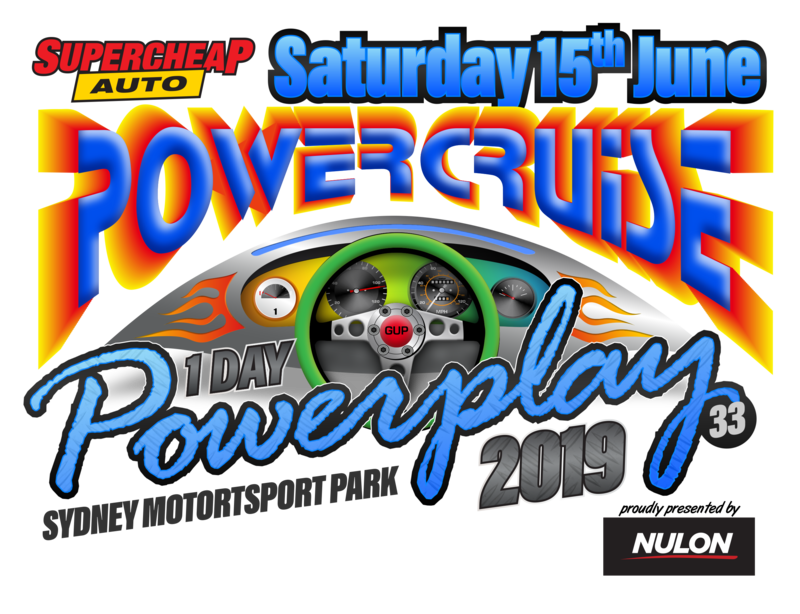 Well it’s that time again folks for Powercruise One Day Powerplay. And what better place to rip up the straights than the newly renamed and freshly refurbished Sydney Motorsport Park so make sure you got the old faithful cruiser ready to rock and roll because your gunna get 1 Day of pure madness in what’s fast becoming the favourite event for all when we do it all in just 1 day. 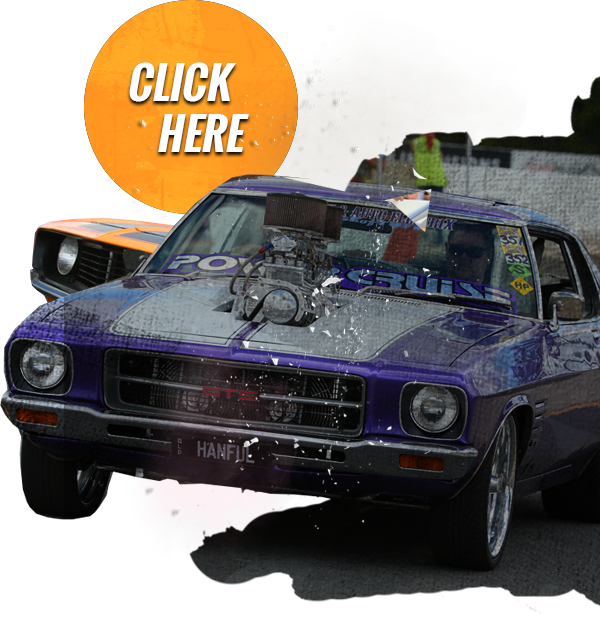 Want to Cruise, Race and Skid your way around Sydney Motorsport Park for 1 day of madness? To be an entrant at the one day Powerplay you need to complete an entry form, if you are pre-entrant, we will send you confirmation text message or email to let you know we have received your form and payment within 5 days of receiving your entry. Your entry confirmation letter will be emailed to you approximately 2 weeks before the event. If you have an unregistered car, you will need to send pics via e-mail to confirm eligibility, it is best to email these pics BEFORE you post your entry form to us. Email pics of unregistered cars to info@powercruise.com and make sure you include your name and contact details on the email so we know who’s car it is! Make sure the pics of the car are good, clear, current pictures – remember we can only base our decision on what we see in the pictures. If your unregistered car has been ok’d, you will receive a reply e-mail letting you know this and also asking you to send a printout of the confirmation e-mail with your entry form to us. Powercruise accepts all cars, of any make, model and modification. However all cars need to be clean and tidy looking cars. All entrants must have a current drivers licence, and be 18yrs or older. Learners Permits are not permitted. We will not be limiting the amount of entrants into the Powercruise 1 Day Powerplay. Powercruise operates on a first in first served policy therefore when you send an entry form to us with your car picture attached, we will send you a confirmation email message to let you know we have received your entry and payment and you will be in. It’s as easy as that. In the event that the weather indicates we may have rain, it is important that you know that we have run in the rain before and Powercruise policy is that we do not cancel the event. We do not postpone the event. We do not offer refunds for any reason including inclement weather as written in the entry conditions on the entry form that you will have to sign. Therefore all entrants are encouraged to come to the event as cruising the track when it’s mildly wet is actually more fun and seeing you wont be able to make smoke, we find more cars all of a sudden have more power than they ever thought they had. While the program may be changed around to suit the conditions, we will endeavour to run all events possible so we can have winners and give out prize money and trophies where possible. Coming to Powerplay? Well you’re going to need a ticket! Spectator tickets do not permit you to drive, and are non-refundable and are not transferable to cash, credit or another event. Cars entered into Powercruise must be in a good presentable standard, Powercruise is a car show after all, this means cars need to be complete inside and out (includes bonnets, front & rear bumper bars and presentable interior), and be fully painted (no undercoat). Any cars that don’t meet these standards may either be declined or declined from cruising and limited to the competitive events only. Acceptance is at the promoters discretion, if you are unsure if your car meets the requirements please scroll down to the Car Pictures Section and submit photos to our office. Pit Lane Carports are a carport which is about 4m wide and 6m deep. These carports have a roof and they have no walls therefore you can’t lock anything up in them. Pit Carports are simply designed to give entrants wishing to buy 1 the chance to have somewhere to retreat to when your not thrashing your car on the track. Pit Carports are very much sort after because they come with a Pit Lane Access Sticker, or a P Sticker as we call it. This P sticker is like gold and entrants from other Powercruise events will tell you they are hard to come by. We don’t sell the P Stickers on their own. Only Carport and Garage owners will receive them as well as a handful of specially selected cars for various reasons. These cars are sponsors cars and invited guests which we understand you want to see more often so they get pride of place. When booking your garage we recommend that you complete and submit your own form and make payment yourself direct to Powercruise. We cannot be held responsible in the event of disputes, errors or any problems if you had someone else submit your form or payment on your behalf. When booking your carport, we recommend that you complete and submit your own form and make payment yourself direct to Powercruise. We cannot be held responsible in the event of disputes, errors or any problems if you had someone else submit your form or payment on your behalf. Feel free to download the program Here >> Powerplay #30 Program, but keep an eye on the website as changes may occur in the lead up to the event. Yes we will have trade sites available at our 1 Day Powerplay events at Sydney Motorsport Park. When sites are available for purchase you will see the downloadable Application & Map below. Please be sure to read over the Form below as it outlines everything you need to know as a trader at Powercruise. Site map is available below, map will be updated weekly so please have a secondary site choice in case your first option isn’t available. Got no other car to drive, then transfer your entry to a spectator pass so you can still get in and watch. Not able to come at all. That is a real bummer. A refund of the entry fees less $40 administration can be given. We must receive the withdrawal in writing, either by email or post before the final cut of date which is advertised on the entry form which is also about 2 weeks before the event.